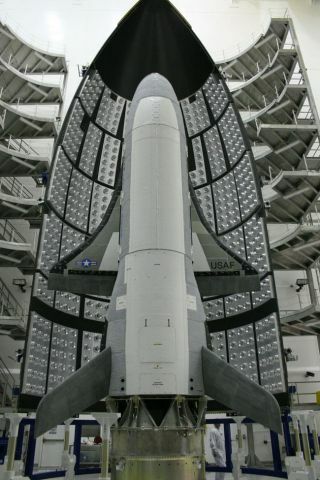 The U.S. Air Force’s X-37B space plane prototype, called the Orbital Test Vehicle 1, is primed for its debut launch into space in April 2010. This week's planned launch of a secretive U.S. Air Forcespace plane prototype has been delayed one day to allow NASA's shuttleDiscovery a clear shot at returning to Earth Tuesday morning. The unmanned X-37Bspace plane, known as the Orbital Test Vehicle, was slated to launch intospace Wednesday from Cape Canaveral Air Force Station in Florida on a secretivemission of unknown duration. But the mission will now blast off Thursday eveningbetween 7:52 p.m. and 8:01 p.m. EDT (2352-0001 GMT) instead due to the delayedreturn of Discovery at the nearby Kennedy Space Center, according to officialswith United Launch Alliance, which is providing space plane's Atlas 5 rocket. The shuttleDiscovery and a crew of seven astronauts were scheduled to land Monday morningat the Kennedy Space Center, but were thwarted by low clouds and rain at theNASA spaceport. The space agency will try again early Tuesday. It's not the first delay this month for the X-37Bspacecraft. Air Force officials originally planned to launch thespace plane Monday evening. They delayed the mission last week when NASAextended Discovery's current spaceflight by one day, making the shuttle'splanned landing the same day. Typically, two days between shuttle landings and rocketlaunches are required in order to reset the Eastern Range, which NASA shareswith the nearby Cape Canaveral Air Force Station, for new space missions. "The first mission will emphasize provingtechnologies necessary for long duration reusable space vehicles withautonomous re-entry and landing capabilities," Air Force spokeswoman AngieBlair told SPACE.com recently. The small spacecraft resembles a miniature space shuttleand is equipped with its own payload bay about the size of a pickup truck bed. According to released specifications, the X-37B spaceplane weighs about 11,000-pounds and is just over 29 feet in length. It standsslightly more than 9 1/2 feet in height and has a wingspan just over 14 feetacross. The spacecraft was built by Boeing's Phantom Worksdivision and its new mission is overseen by the Air Force Rapid CapabilitiesOffice. The X-37B is designed to launch into space unmanned toheights of up to 500 nautical miles, loiter in orbit for up to 270 days, andthen re-enter the Earth's atmosphere to make an automated landing at VandenbergAir Force Base in California. The spacecraft originally began its life as a NASA X-37project to develop a new generation of reusable spacecraft. NASA shuttered theproject in 2004 when funding dried up and turned the space plane over to theDefense Advanced Research Projects Agency (DARPA). The Air Force took control of the prototype in 2006,though exactly what the X-37B will do on its first mission ? dubbed OrbitalTest Vehicle 1 (OTV-1) ? remains a mystery. Some outside observers have said the Air Force's upcomingtest launch could be seen by other countries as another push by the UnitedStates into the possible weaponizationof space. Others, however, contend that the results of the X-37B's debutspaceflight could lead to better commercial space planes in the future. Mark Sirangelo, corporate vice president of space systemsfor the commercial spaceflight company Sierra Nevada Corp., has said the AirForce's test flight is of great interest to his company. Sierra Nevada is developinga commercial space plane called Dream Chaser, which is also designed to launchatop an Atlas rocket. "Weexpect that this [X-37B] launch experience will also help our knowledge of theAtlas's performance relative to lifting body vehicles," Sirangelo toldSPACE.com in a recent interview. "The X-37 seems to be focused on militaryneeds and is an unmanned demonstration while we are focusing primarily on acrewed civil and commercial mission profile." SPACE.comSpace Insider Columnist Leonard David contributed to this report from Boulder,Colo.